In the early months of 2016, Friends of the Rappahannock (FOR) received a watershed round-table grant from the Virginia Department of Environmental Quality (DEQ) for outreach and restoration work throughout the Rappahannock River watershed. One of the primary initiatives outlined in this grant is water quality in Carter’s Creek. 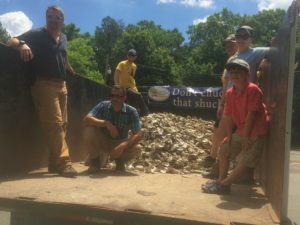 This summer FOR teamed up with Lancaster County, Virginia Commonwealth University’s Rice Center Oyster Shell Recycling Program, and W. E. Kellum Seafood in Weems, to restore historic Carter’s Rock Oyster Reef in Carter’s Creek for an educational oyster reef sanctuary. This began with the team shoveling oyster shells from a collection site into a truck. The shells are recycled from local businesses and residents from Lancaster County and are a larger part of the statewide efforts of the Oyster Shell Recycling Program. At the end of the day our partners were able to install approximately 2,000 bushels of shell on privately leased river bottom. The installation of the reef coincided with the early oyster spawning season, which should produce excellent recruitment results on the newly-installed shell. Kellum Seafood has generously donated this historically-productive river bottom to FOR. As lease holders, FOR will establish monitoring programs with local students and volunteers for the reef, which will remain in sanctuary. In addition to providing habitat, filtering water, and developing broodstock for future generations of oysters, the sanctuary reef will be the centerpiece of a non-point source pollution awareness campaign in the Carter’s Creek Watershed.